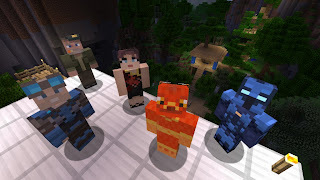 New Minecraft 360 skins coming soon! A new skin pack will be coming for Minecraft: Xbox 360 Edition, according to PlayXBLA. Skin Pack 2 will feature 45 new skins, including the pictured Level 5 from Crackdown 2, Joanna Dark from Perfect Dark, Damon Baird from the upcoming GoW: Judgement, Pretztail from Rare's Viva Pinata, and Bill (Pills here!) from Left 4 Dead. More skins will be revelaed soon, as well a price point from the new skin pack.